George Wallach was one of the best ever Scottish distance runners but is one of the least known. 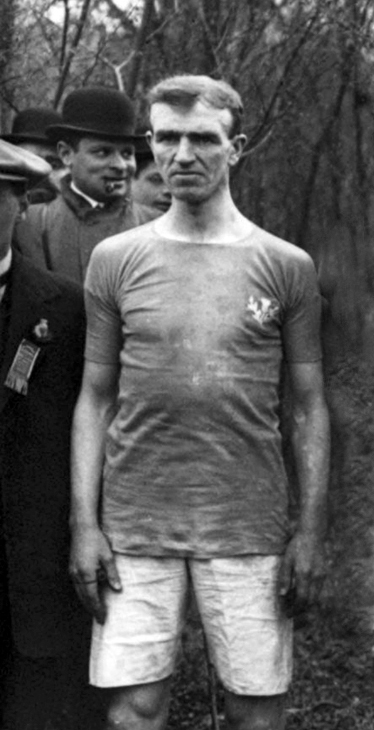 He ran in nine world cross-country championships (and would certainly have been more but for the interruption caused by the 1914-18 War) and won silver and bronze. On the track he won the SAAA Four Miles championship in 1911 and 1913, the Ten Miles in 1913 and 1914, twice setting Scottish records for the distance. He represented Scotland in the Four Miles in the Irish international in 1911, winning the event. Despite being a Scottish internationalist and medalist, Wallah was half German: his father was Hermann Louis Waldemar Wallach and he was a Prussian tinsmith who travelled to Kirkcudbright where he married a local girl. Janet Wallach was Scottish through and through..
George Curtis Locke Wallach was born in Scotland, in Castle Douglas on March 20th, 1883 and died on April 2nd, 1980 (Aged 97.013) in Manchester, Greater Manchester, Great Britain. He moved to England in 1905 to take a job in Lewes, Sussex where he joined Brighton & County Harriers. The following year he moved to Lancashire to work for the Manchester Evening News and continued his running with Preston Harriers and lived the rest of his life in England. He often came up to Scotland for championship meetings and was said to be very popular with the spectators. Colin Shields thought that Wallach’s best international appearance may well have been his first one: “Arguably his finest run was in his first international championship in Belfast in 1910. Having achieved 2nd place in the English championships in 1910, he was selected by Scotland to run in Belfast. Approaching the final run in at Belvoir Park, Wallach was forcibly removed from the international race by the police while in first place. Police officers had noticed that his shorts had been substantially torn while negotiating the barbed wire fences of the course and on grounds of public decency, removed him. He was forced to watch Wood of England and Essex Beagles run past and win the individual title, a result that cost him the title and the Scottish team a certain second placing in the team contest.” Yes, a policeman removed him from the race and ‘he acquiesced’ and stood stock-still watching the field stream past t the finish. It was a ‘dnf’ for Wallach in the international. In his book “Whatever the Weather”, Shields observes that “It is difficult in these days of appearance money and sponsorship for athletes when large sums of money depend on the performance of athletes in major international championships to realise how calmly Wallach accepted the police action which deprived him of almost certain victor. It is more than possible that nowadays an international athlete in the same circumstances would tear himself free and run on to victory. The enhanced publicity about the torn shorts and resistance of arrest would give him an enhanced monetary valuefor future competitive appearances and result in fame and fortune. Who can say which is the better state of affairs?” Later that year – on 2nd April at Hawkhill Grounds in Edinburgh, Wallach won his first SAAA track medal when he finished third in the Ten Miles Track Championship behind Tom Jack and Alex McPhee. Although unplaced in either Scottish or English National Championships, Wallach was selected for the international to be held in Wales in 1911. He finished third – the first of six occasions when he was in the first eight of the race. The Scots were the third team. In the track championships on 24th June, he won the Four Miles fairly easily – reports say that he won by 24 yards but could have easily extended that lead. Scotland won the international against Ireland in Dublin in July and Wallach played his part by winning the Four Miles in 20:27. The event was decided on which team had most individual winners and Scotland had seven to Ireland’s four. Jack, Wallach and Kerr were selected for the international the international to be held at Powderhall in July. However before that he was selected to compete in the inaugural Olympic 10000m in Stockholm. Competing on Sunday, 7th July, he dropped out in Stockholm. He was not the only GB representative to fail to finish in this new event – the 5000m and the 10000m were inserted into the programme instead of the Five Miles which had been held in 1908 – as George Lee, Charles Ruffell, Frederick Hibbins and Thomas Humphrey also failed to complete the distance. The preview of the Scoto-Irish match on 20th July noted that he ‘ did not seem to have taken too well to the airs of Stockholm and may be off-colour.’ In fact he did not run at all in the match – many of the Olympians called off including JT Soutter and WA Stewart. It’s fair to point out that Ireland lost the services of JJ Flanagan who had also been competing at Stockholm. That winter he finished fourth in the North of England championships and in the first ten in the English National, and was selected for the Scottish team in the international held in Paris. France’s Jean Bouin won for the third consecutive year and Wallach in eighth led the Scots team home for the third successive year – he was to be first Scot across the line for his country in six of his nine appearances. In summer 1913 he won the SAAA 10 miles track race at Celtic Pard in a new Scottish record of 53:01. Colin Shields tells us that this time was “far outside his personal best of 51:36 set a few weeks earlier in England, despite a most unusual and unsettling preparation for the race. Having to work as a printer with the Manchester Evening News on the night before, he caught the morning express train on the day of the race, arriving in Glasgow just a couple of hours before the race started. He displayed what a fine distance runner he was by lapping the entire field except for Archie Craig who finished runner-up just outside 54 minutes in a time beaten on only four occasions since the race was first held in 1886. He set records en route for 8 miles (42:13.2) and 9 miles (47:39.2). “Newspaper reports of the era always referred to GCL Wallach when reporting details of his many athletic triumphs. Born in Castle Douglas, the twelfth of eighteen children he died aged 96 years in 1979. He lived and worked for most of his life in England, competing extensively in English races. He was a remarkable cross-country runner who represented Scotland nine times in the international race and finished as first Scot home on six of these occasions. He was a typical Harrier, tough, rugged and determined – a hard man of athletics who was renowned for his pace and race judgment, with hs strength and staying power being his forte, rather than his finishing speed which was always judged to be lacking for the international class runner that he was. He won the National in 1914 and 1922, representing Greenock Glenpark Harriers and the first world war must have robbed him of the opportunity of many more victories. In those times the majority of roads were surfaced with sets of cobbles which were extremely painful to run on, causing bad blistering, and in the evenings there was only limited street lighting to to illuminate the poor road surface. Wallach trained mainly on the track in the evenings, and from New Year onwards, utilised Belle Vue track in Manchester where he lived and worked. Admission to the track cost 4d (1.5p) with the changing rooms being in a dilapidated wooden structure open to all the winds that blew with doors that never shut properly. Wallach changed by the light of a candle and once on the track there was only the glow from the adjacent street lights to distinguish the grass verge from the cinder track. Baths, showers or adequate toiled facilities were undreamed of luxuries at Belle Vue but Wallach took all the difficulties that would horrify modern athletes in his stride. That passage is typical of the excellent work done by Shields in his book ‘Whatever the Weather’ which is thoroughly researched, well written and very informative. We are however starting to get a bit ahead of ourselves as far Wallach’s career profile is concerned and need to go back to the 1914 track season which started well with a win in the SAAA 10 miles track championship in Edinburgh on 4th April. The report was quite detailed. “Ideal conditions favoured the twenty sixth annual championship over the distance which was run at Hawkhill Grounds, Leith, on Saturday afternoon, and the running was in keeping with the occasion. The holder, GCL Wallach (Greenock Glenpark Harriers and Bolton United Harriers) was opposed by a field of seven which included SS Watt (Clydesdale Harriers), the 1911 champion, G Cummings (Bellahouston Harriers), AG Ledingham (Waverley Harriers), the Eastern District cross-country champion, and CP Abbott (Gala Harriers), but he outpaced them all and set fresh Scottish native records from seven to ten miles inclusive, his own last year’s record at Celtic Park being beaten by 12 2-5th seconds. Unfortunately for Wallach, and many others of course, the outbreak of War later in the year meant that a huge hole that could never be repaired was torn in his career and when the War ended he was 35 years old. Nevertheless he was back in harness after the War and with the first running of the international at the end of the 1920/21 season there was a target for all Scottish distance runners. Wilson missed the race but Wallach was forward for the race in which J Hill Motion (Eglinton Harriers) was the victor with Wallach second. In the International, held that year in Newport, Wallach was yet again first Scot home when he finished in eighth place. A year later and he regained the Scottish cross-country title defeating Archie Craig (Bellahouston)and J Riach (Maryhill) and qualifying for the international at the age of 40. He finished fourth and first Scot yet again. Not finished yet, he took part in the international again in 1923 and 1924! In 1923 he was twenty second and in 1924 twenty third. Each time he was a counting runner. In 1924, his final representative honour, he had just celebrated his 42nd birthday. Wallach was a remarkable athlete and one who should be more celebrated than he currently is.